Do you love setting up action shots or capturing photos that are totally unique in its inspiration and angle? If you have answered in the affirmative, then you would most probably find the Theta Z1 360-degree camera to be well worth the effort. Ricoh has just announced the Theta Z1 360-degree camera, making it king of the hill in this department. This latest model will be able to support approximately 23-megapixels resolution (6720 x 3360 pixels) 360-degree still image photo shooting, letting you capture great looking spherical images in a single shot. Surely all of your social media accounts will be able to benefit from such a device in terms of wowing your followers. Being the flagship model in the series, the Theta Z1 360-degree camera’s compact main body will arrive equipped with a 1.0-inch back-illuminated CMOS image sensor. Fully capable of supporting a diverse range of shooting modes, one will be able to choose from aperture priority so that one can capture high-quality images regardless of the setting (outdoors, nighttime, indoors, tropical beaches or snowy mountain views). There is virtually no limit to the surrounding environment which will hinder your photo taking sessions, and it is also possible to capture rather smooth and immersive 360-degree videos in 4K (3840×1920 pixels) and 30 frames per second (fps), all made possible courtesy of its powerful 3-axis rotational stabilization that will help compensate for rotational shake. On the main body of the Theta Z1 lies a 0.93-inch organic EL monitor and a Function (Fn) button. This allows the user to access a wide range of information at a glance, ranging from the number of possible shots to exposure settings and others. There is also built-in support for Adobe DNG format (RAW) for professional image editing enjoyment, and the Android-based system provides flexibility in number of expansions that one can add to the Z1 via the installation of additional plug-ins. 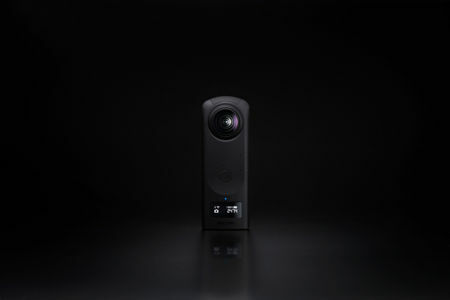 Expect the Theta Z1 360-degree camera to be readily available from this month onwards.